This is a quick and easy recipe for eggplant Parmesan “light.” It’s light because it’s not coated in breadcrumbs and fried, not that there’s anything wrong with that. It’s quick and easy because all you have to do is stack the ingredients and pop it in the oven. We topped ours with a little homemade pesto. 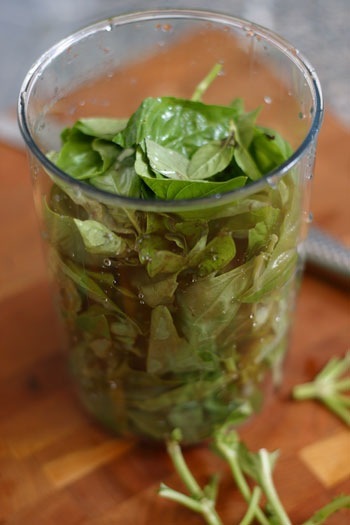 This recipe works best after salting the eggplant, ridding the eggplant of bitter juices. 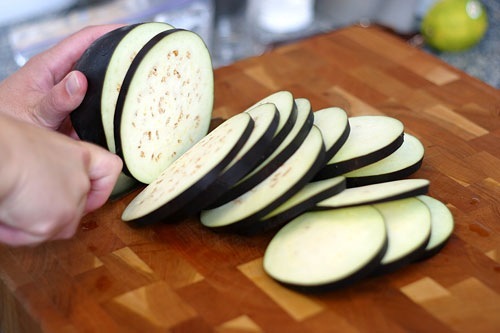 Cut the eggplant into round slices, at least 1/4″ thick. Toss the eggplant with 3 teaspoons Kosher salt. Transfer to a large colander set over a bowl. Let sit for 30 minutes. Spread eggplant on a triple layer of paper towels. Cover with another triple layer of paper towels and press firmly on each slice to remove as much liquid as possible. Wipe off excess salt. Spray baking sheet with Pam, place eggplant on baking sheet. Drizzle or brush each slice with olive oil and sprinkle with salt. 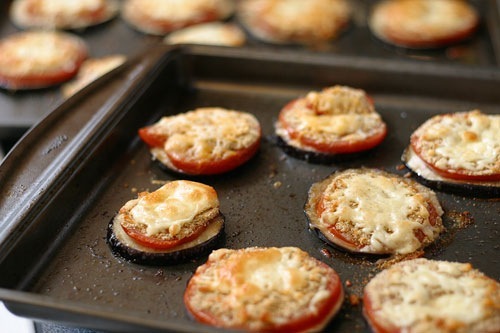 Slice the tomatoes into 1/4″ thick rounds and place on top of eggplant. Try to match eggplant size to tomato size. Top each stack with breadcrumbs, then top with mozzarella cheese. Bake for 15-20 minutes, until cheese starts to bubble and brown. Oh wow! That looks absolutely delicious, I love how you took an old favorite and added your own twist. You also did an amazing job with the pictures, I will definitely try this recipe over the weekend. Is the eggplant supposed to be “squishy”? I even salted mine before cooking-What happened? I have 2 peach trees in our yard. One tree is almost barren this year, but the other is filled with peaches. Almost ripe. In past years, we’ve had peach ice cream, peaches with ice cream, and peach cobbler, but I’m thinking peach preserves this year. What do you think? I’m dying to try this recipe! Thank you for a great site and I must say your slices of eggplant are flawless! Eggplant Parmesan looks perfect.. never tried this before.. thanks for sharing such a wonderful recipe.. I literally squealed when I Stumbled across this recipe. I have been DYING for a new eggplant recipe (ratatouille is nice, but it gets boring). So tonight, I made this! I did salt the eggplant beforehand, as soggy eggplant is quite unappetizing. Also made a few changes; instead of using a tomato (as I neglected to remember to buy one at the store), I used a little bit of plain tomato sauce. I subbed some parm. and romano instead of mozz. Also used some seasoned breadcrumbs, because that’s all I had on hand. Regardless, this is a wonderfully simple and delicious meal that is going in my recipe book. Perhaps salting is a good idea, that’s what all the cookbooks recommend. We picked up some eggplant from the farmers market this weekend…we’ll give that technique a try and report back. 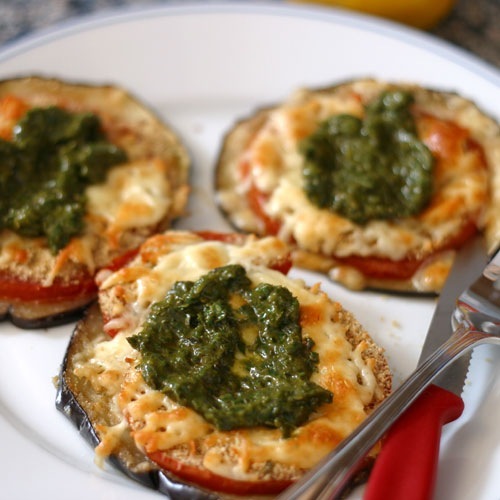 Now this is a fun way to make eggplant parm! And no salting of the eggplant ahead of time to let the water out? That saves 30 minutes right there.